Yes, I was this close to the Pope’s drive-by! For the first nine days (May 13-21) of my sojourn in Israel and Palestine, I traveled alone, including a four-day, self-guided walking pilgrimage from Nazareth to Capernaum on the “Jesus Trail.” For the second nine (May 22-30), I was part of the Challenge and Hope in the Holy Land Tour of the Pacific Southwest Region (PSWR) of the Christian Church (Disciples of Christ). In planning to travel alone, part of my goal was to be free to take in atmospheres; to meditate on sight, sound, and information. I observed ragged men, hardly different from their American brothers, lining up at the homeless shelter and rehab facility between Jaffa and Ted Aviv. I meditated on the 20th century stained glass of the 19th century Lutheran Church in Jaffa’s old German Colony. I pondered the ruined beachfront night club in Tel Aviv, covered with cartoonish graffiti, a plaque memorializing those killed in a 2005 bombing. On early morning walks during both parts of the trip, I saw merchants setting out grape leaves and toys in Jaffa, Nazareth and Jerusalem. I was borne up in the transporting chants of Orthodox monks in the near-empty Church of the Holy Sepulcher, as they harmonized with their own echoes from the dome above. I was thoroughly discomfited by the testosterone soaked roaring of flag-draped pilgrims dancing mosh-pit horas at the Western Wall. My most powerful experience came in witnessing an extended conversation between the Arab owner of Nazareth’s Fauzi Azar Inn, and the Israeli Jewish family that had, with me, just finished the inn-sponsored tour of the Old City. Suraida Naser, the granddaughter of Fauzi Azar himself, was usually scheduled to share her family’s history at the beginning of the tour, but had, she confessed, dodged us because she was weary of arguing with Israeli Jews about history, politics, and her family’s experience. Nonetheless, the staff persuaded her to sit down with our small group. She told of her grandfather’s loss of land and orchards during the Nakba (“Catastrophe”) of the Israeli take-over, the difficulties of maintaining the family home in the face of Israeli regulation, and her cynical view of Israeli leftists (“At least with Sharon, you knew he hated you.”) She told of her resistance to being invited by a Jewish businessman (Moaz Inon, co-creator of the Jesus Trail) to convert the uninhabitable family manse into a guest-house—other Arabs would, and did, think that they had sold out to a Jew. And she shared her eventual decision to be part of the venture, provided she could share her family’s story with guests. incredulous (at, for instance, the assertion that Hamas is a Mossad creation), and remained earnest in their desire to have a real dialogue. Mercifully, almost all discussion was, purely for my benefit, in English. When Suraida left to take a phone call, I leaned in, and asked the family “How often do these kind of conversations take place?” “Once a decade,” said Udi, the father. His son offered, “We’ll talk with waiters for two minutes, but not like this.” One of his daughters, Nama, confessed that she was 26, and had never had this kind of interaction. Suraida had to move on to other business—our conversation had lasted perhaps four times as long as the scheduled 20 minutes—but Udi’s family invited me to lunch. Walking to the recommended (Arab!) restaurant, I spoke at length with Nama and her boyfriend, and visited more with the whole family at lunch. They were surprised to hear that the U.S. is “pro-Israel”—they were more mindful of an artistic boycott of Israel by Western stars. They knew about the U.S. Jewish lobby, but nothing of so-called Christian Zionists. For their part, they were skeptical of the segregation wall and the occupation, but proud of their obligatory military service. They acknowledged the escalating choice between having a Jewish state, or a democracy—and the boyfriend wondered how America could stay American if it was increasingly less white. They were stirred by their conversation with Suraida, yet frustrated as to what to do—they feel they are more and more in the minority among Israeli citizens. And yet, I felt this day might well stick with the. It will surely stick with me, messy, unique, and provocative. I had anticipated random interactions with other hikers on the “Jesus Trail,” while enjoying a measure of solitude. I was surprised—and, even for a natural introvert, disappointed—that I saw no one else on the route, save the milling bus-tour groups at popular sites. I surely enjoyed the physicality of moving from one place to another on foot, taking in the agriculture, the views, suffering the occasional biblical swarm of flies. I thought my hosts in Cana were uncomfortable with English until I asked the wife about the religious program she was watching—a Marionite music station out of Beirut—and then heard to paragraphs of enthusiasm. At the Druze shrine of Nevi Shu-eib, I was reverently, mutely guided through the taboos of visiting Jethro’s Tomb, and I gained a Facebook friend from talking with Wled, a Druze boy in the shops outside. 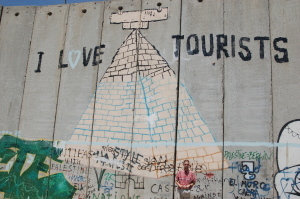 While the PSWR group went to several sites of pilgrimage, a significant portion of the tour was geared toward receiving information from various agencies about the struggles and history of occupied Palestine. 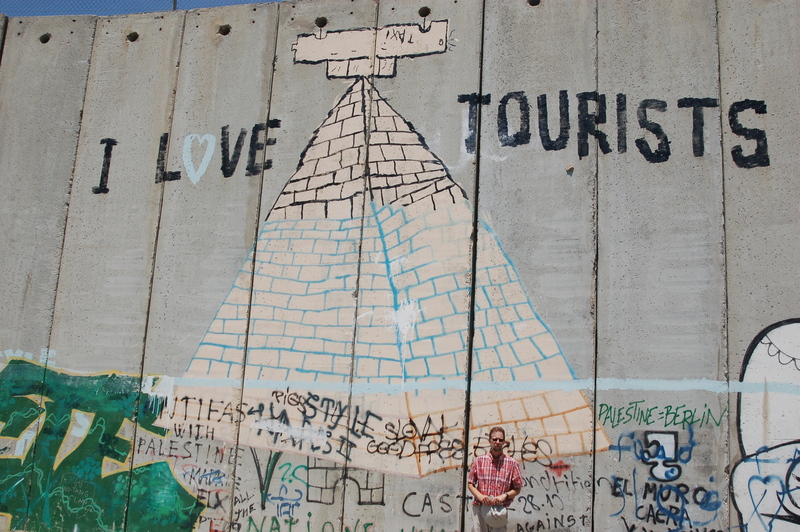 We visited several advocacy groups—one Jewish, one an intentionally blended community, the rest Palestinian. While the information was useful, we found the deepest sharing came when we were able to invite presenters to offer something of their own personal journey. Such testimonies served, by no means as a substitute for more in-depth information, but rather as strongly effective points of access for the more factual data. For example, Osnat Skoblinski, when asked, shared her transformation from self-described ultra-nationalist, ultra-Zionist Russian immigrant to her present position as a new representative of the Israeli human rights organization, B’Tselem. Another: asked about the stress of occupation, our overnight host in Bethlehem found himself caught up in an emotional recounting of childhood trauma, the power of which surprised him, I think, as much as us. and spiritually experience holy sites. (My only grave disappointment was not being able to visit the Dome of the Rock and the Al-Aqsa Mosque.) Suggestions include offering informational seminars state-side before future trips, perhaps even with a representative of one the agencies to be visited. Prior reading could also be more strongly advised—a list was offered, but I suspect few others undertook much of the effort of reading the material. Upon my return, I have found that it is the personal testimonies that most help the uninformed, and even the skeptical, receive the difficult data that rises up out of the Palestinian struggle. I have just finished a five-sermon series on my trip, the last two messages being formed around responses to written questions from the congregation. I also put on a longer program on a recent Saturday morning; I am scheduled to share with two Sunday School classes, and an outside community group. So far, reaction has varied from “I didn’t know—what can I do?” to “I haven’t heard this—let’s talk more” to, in just a few cases, “I don’t agree and I don’t want to hear any more.” It each case, it has been the transmission of personal testimonies that has proved most compelling—that, and people’s stunned responses to a detailed map of the West Bank. 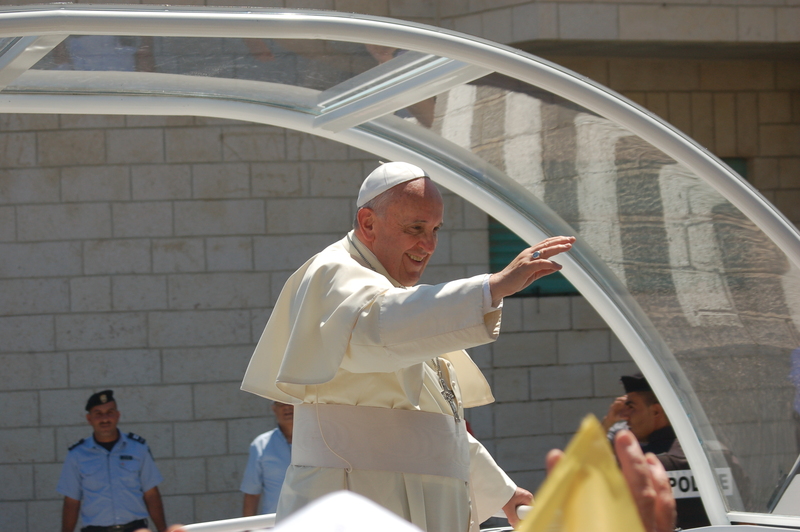 As planned, I was able to post an almost daily blog to our church’s website—the only day I missed was due to the overnight stay with a Palestinian family. A number of members, friends and family followed the posts; quite a few more also followed my shorter posts to Facebook, and several have gladly received collected hard-copies of all my posts. I am immensely grateful to the congregation of First Christian Church for allowing me the time and financial support that made this journey possible. I am thankful as well to PSWR and PNME for the additional scholarships that helped minimize the remaining expenses. More specifically, I appreciate Nancy Fowler’s hard work in putting together these pilgrimages, and in being an unflagging advocate for peace. In addition, I thank PNME for the invitation to write this report, and there-by reflect once again on a least a portion of my journey.